An F-15E from the USAF’s 4th Fighter Wing flies over Afghanistan in April 2006. The USAF rotates detachments of F-15Es to Southwest Asia from where they conduct close air support missions for troops on the ground engaged in rooting out insurgent sanctuaries and support networks. 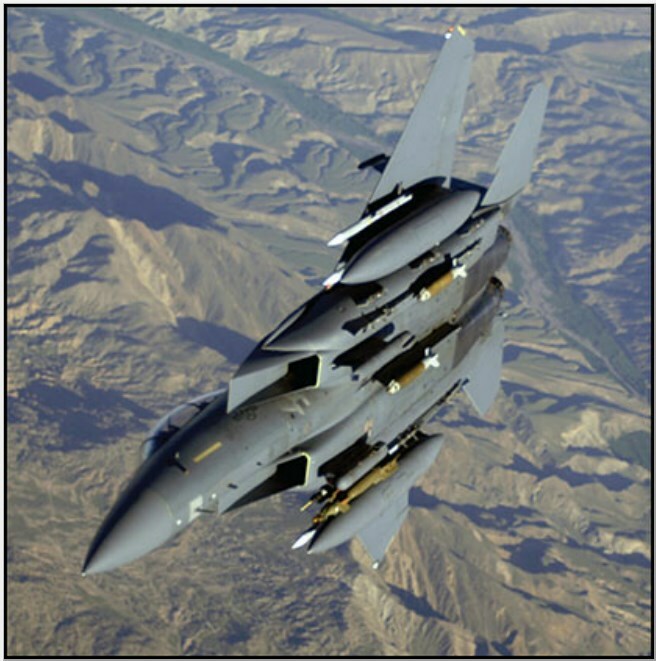 Over Afghanistan, F-15Es typically carry a mix of 227kg (500lb) GBU-12 laser-guided bombs and 907kg (2000lb) GBU-31 GPS-guided bombs, plus up to 500 rounds of ammunition for their M61A1 20mm (0.79in) cannon. For surveillance and targeting, the Strike Eagles are fitted with the Lockheed Martin Sniper XR targeting pod. Flying from Bagram in Afghanistan, F-15Es combine with F-16s to provide close air support coverage for all of eastern Afghanistan, two squadrons of aircraft putting most of their aircraft into the air each day, and also flying frequent ‘show of force’ missions involving no ordnance. Since its introduction into the operational U. S. Air Force inventory in 1976, the McDonnell Douglas (now Boeing) F-15 Eagle has reigned supreme as the world’s premier air superiority fighter. Developed in the generation immediately preceding stealth, supercruise, and advanced digital avionics, the F-15 represents the apex of its era. Conceived as strictly an air-to-air fighter, from the outset the Eagle’s design emphasized a beyond-visual-range (BVR) capability, permitting the aircraft’s pilot to detect, identify, track, and fire at bogeys prior to entering the ring of visual contact. At the same time, massive control surfaces and an incredible thrust-to-weight ratio confer the traditional air-to-air fighter attribute of maneuverability. The aircraft, big for a fighter, was scaled up to provide for twin-engine reliability and a fuel capacity allowing for an extended combat radius. These air-to-air fighter virtues have application to tactical aircraft committed to the air-to-ground mission. Logically, then, the contractor considered producing an adaptation of Its basic air¬ frame as a dedicated ground attack aircraft retaining air-to-air prowess. Approximately a decade after the first F-15 entered service, the ground attack variant, designated the F-15E and called the Strike Eagle, made its maiden flight. The complexity of this type’s mission requires that there be two crew members, the pilot up front and the weapon systems officer (WSO) in the rear seat. Becoming operational in 1989, the Strike Eagle was able to take advantage of the unfolding digital revolution. The WSO has four multipurpose cathode ray tubes providing a variety of data from navigational coordinates to bogey locations to a weapons selection menu. Systems include the AN/APG-70 synthetic aperture radar. LANTIRN navigation and targeting pods allow high-speed terrain-following flight and laser designation of ground targets, respectively. The F- 15E can carry more than twelve tons of ordnance, including sophisticated precision guided munitions and “iron” bombs, as well as an array of air-to-air missiles for its own defense. In addition, the aircraft, like its air-to-air counterpart, is equipped with a 20mm cannon. Even in this new age, the aircraft remains an impressive dual-role platform. The Strike Eagle has replaced the aged F-111 tactical bomber. 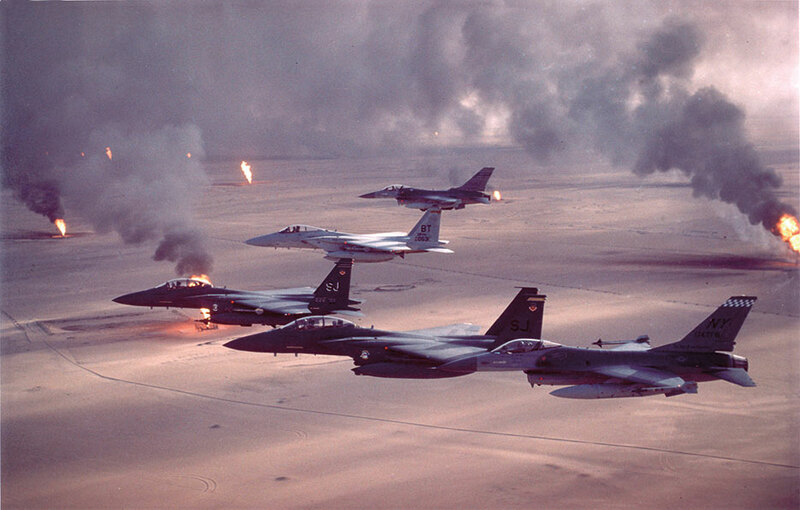 Given its ability to conduct surgical strikes and to more than hold its own against air-to-air threats, the F-15E, not surprisingly, was In the forefront of the hunt to eradicate the Scud missile menace during the 1991 Persian Gulf War. The mission was frustrating because the Scuds could be constantly repositioned on mobile launchers across the vast Iraqi landscape. The missiles could be concealed from aerial view by, for example, placing them under bridges. Also, there were reports that decoys were being used to dupe the coalition’s forces. The tactics that were developed to cope with these problems involved the use of airborne infrared sensors to pick up a heat source immediately upon launch of a Scud. Yet, even this method¬ ology had Its drawbacks, since the mobile launchers would ordinarily be well on their way into hiding by the time a Strike Eagle or other ground attack aircraft could be vectored to the area. Meanwhile, Scuds were raining down on Israel, which was sitting out the war at the behest of the United States. It was feared that continued Scud attacks on Israel would pressure its leaders into striking back, which would threaten the fragile coalition. Scud hunting became a top priority. Once a McDonnell Douglas product, the F-15E Strike Eagle and its derivatives now come under the responsibility of Boeing, which absorbed the previous company. The first flight of the F-15A was in July 1972. In November 1974, the first Eagle was delivered to the 58th Tactical Fighter Training Wing at Luke Air Force Base, Arizona. In January 1976, the first F-15 destined for a combat squadron was delivered to the 1st Tactical Fighter Wing (TFW) at Langley AFB, Virginia. An improved single-seat F-15C and two-seat F-15D equivalent entered the Air Force inventory in 1979 and were first delivered to Kadena Air Base, Japan. These models were equipped with production Eagle package improvements, including additional internal fuel, provision for carriage of conformal fuel tanks and an increased maximum take-off weight. When first drafted, the F-15 Eagle was intended to be capable of conducting air superiority or air-to-ground missions with equal efficacy, but the strike role was soon dropped from the original Eagle, and the successive F-15A to D variants that entered service with the USAF have been used exclusively for air-to-air duties. In 1982 McDonnell Douglas began trials of an air-to-ground Eagle, when it modified the second two-seat TF-15A trainer as a privately funded ‘Strike Eagle’. At the time, the USAF was looking for a successor to its F-111 and conducted an evaluation of the Strike Eagle against the rival General Dynamics F-16XL, a cranked-wing development of the F-16 Fighting Falcon. The Strike Eagle was judged the winner and was ordered into production. The first F-15E production machine undertook its maiden flight in December 1986. The F-15E Strike Eagle began the ‘second generation’ of F-15s. Equipped with new avionics and with multi-role capabilities, these aircraft remain in production for export operators. In the front cockpit, the USAF’s F-15E introduced redesigned controls, a wide-field-of-view head-up display and three CRT displays providing the pilot with navigation, weapons delivery and systems operations data. The rear seat of the aircraft is occupied by the weapons system officer who is provided with four multi-purpose terminals for radar, weapons selection and monitoring of enemy tracking systems. Primary sensors comprise the AN/APG-70 radar and the LANTIRN nav/attack system, the latter comprising two separate pods with terrain-following radar linked to the flight control system and a targeting capability for the delivery of laser-guided weapons. The F-15E has subsequently added the more modern Sniper and Litening targeting pods. The F-15E’s original Pratt & Whitney F100-PW-220 turbofans with a digital electronic engine control system were soon replaced by more powerful F100-PW-229s, which were included in production from 1991 and retrofitted in earlier aircraft. The production run for the USAF amounted to 236 aircraft. The Strike Eagle entered service with the 40th Tactical Training Wing at Luke AFB in 1988, and initial operational deliveries then followed to the 4th TFW at Seymour Johnson AFB, North Carolina. The F-15E made its combat debut during Operation Desert Storm, when its primary mission was to seek and destroy Iraqi ‘Scud’ mobile ballistic missiles. Since then, the F-15E has been at the forefront of every major U.S. military air campaign. 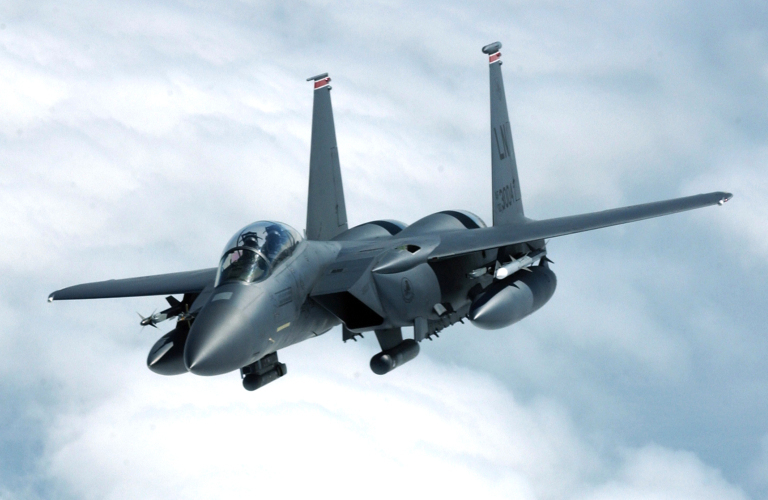 The first export customer for the Strike Eagle was Saudi Arabia, which initially purchased 72 F-15S aircraft in 1995. These retain the F-15E airframe but lack the conformal fuel tanks and have some items of downgraded equipment. Israel, meanwhile, acquired 25 F-15I Ra’am (Thunder) versions featuring equipment of local origin. Boeing has also delivered 40 F-15K Slam Eagles to the Republic of Korea. Developed to meet Korea’s FX requirement, the F-15K has General Electric F110-GE-129A engines, AN/APG-63(V)1 active electronically scanned array (AESA) radar, Joint Helmet-Mounted Cueing System (JHMCS), an updated cockpit with seven multi-function displays, the Lockheed Martin Tiger Eyes sensor suite with infra-red search and track (IRST) system and the AGM-84 SLAM-ER missile. Singapore purchased at least 24 F-15SG jets that are broadly similar to the F-15K, but with APG-63(V)3 radar. Most recently, Saudi Arabia placed an order for a new version, the F-15SA, the most advanced Eagle to date, which features the AN/APG-63(V)3 radar, Joint Helmet-Mounted Cueing System, IRST, Sniper, a BAE Systems defensive suite and new fly-by-wire controls. The Saudis are acquiring 84 new F-15SAs and upgrading up to 70 existing F-15S aircraft to the same standard.